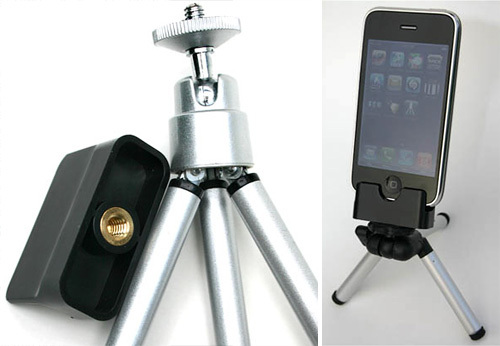 Blur iPhone Tripod Adapter | OhGizmo! For just $14.99 you get the adapter which attaches to the bottom of the iPhone (presumably using the dock connector) a pocket-friendly though somewhat useless mini tripod and the Blur Tripod iPhone app which gives you a shutter timer, what sounds like an intervalometer and even a level. The app can also be purchased on its own for just $0.99.